Born: 14 March 1836 in Merstham, Surrey. She was baptised 18 April in Mersham and died aged 55 in 1891. Daughter of: Rev Alfred Lyall (1796-1865) and Mary Drummond Broadwood (1809-1878), of Harbledown. 1. Walter Tschudi Lyall (1832-1903) who married Mary Ann Streeting (1836-1919). 2. Sir Alfred Comyn Lyall (1835-1911), Lieutenant-Governor of the North-West Provinces in India. He married Cora Cloete (18??-1913). 3. Sir James Broadwood Lyall (1837-1916), Lieutenant-Governor of the Punjab in India. He married Katherine Cautley (18??-1934). 4 Catherine Stewart Petre nee Lyall (1839-1908) who married Rev Robert Godolphin Petre (1818-1910). 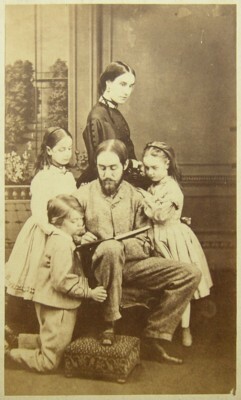 5 Arthur Edward Lyall (1840-1844). 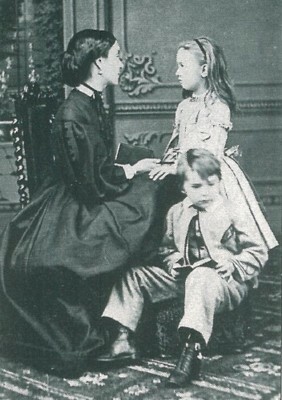 7 Barbara Dorothea Webb nee Lyall (1845-1897) who married RW Webb. 8 George John Lyall (1848-1880). 9 Harry William Lyall (1852-1915). 10 Mary Rivaz nee Lyall (1856-????) who married George Wilmot Rivaz. Marry married: 23 Oct 1855 Rev Francis James Holland (1828-1907). 1. Bernard Henry Holland (1856-1926) who married Florence Helen Duckworth (18??-1933). 2. Mary Agnes Holland b. 1859, Canterbury, Kent, m. 1889, William Henry Bolton, occupation Clergyman, d. 4 Aug 1902. Mary died 18 Sep 1928. 3. Alfred Dunstan Holland b. 1860, d. 24 Aug 1869. 4. Lucy V Holland b. 1862, Paddington, Middlesex, d. 1886. 5. Francis Caldwell Holland (1865-1948) who married Maud Constant Walpole (1870-1947). 6. Michael James Holland (1870-1956) who married Marion Ada Flora Broadwood (1887-1969). Mary spent her childhood at Godmersham and Harbledown. She was 19 when she married Francis James Holland in 1885. The young couple lived at St Dunstan's, Canterbury, where Francis was the Vicar until 1861. Their first three children were born there. Mary was quite a socialite of her day, and a prolific letter-writer. Her son Bernard Holland (1859-1926) published in 1898, 'Letters of Mary Sibylla Holland'. This volume contained 297 pages and a supplimentary volume of a further 61 pages was published the following year. In fact a large family archive of her original letters still exists together with a large number of letters from her husband, her parents and her children (approx 1300 letters).